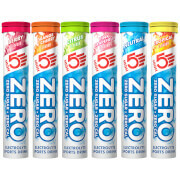 The mixed bundle pack contains 3 tubes of cherry/orange, citrus, pink grapefruit High5 Sports Zero Active Hydration Tablets and a single pack of High5 Sports Zero X'treme Caffeine Hydration Tablets - Berry. Each tube contains 20 Zero hydration tablets. ZERO contains Vitamin C and 5 electrolytes, including sodium, magnesium and potassium. Vitamin C in ZERO supports a healthy immune system, protects the cells from oxidative stress and contributes to the reduction of tiredness and fatigue. Magnesium in ZERO contributes to electrolyte balance, reduces tiredness and fatigue, whilst supporting muscle protein synthesis. Simply drop a tab into your re-usable sports bottle and watch it rapidly dissolve. The 20-tab tube makes up to 15 litres of drink, so it's great value for money. With minimal packaging, ZERO is environmentally friendly and easy to keep with you. The easy-break tabs mean that you can choose your ideal drink strength. Each tube contains 20 tablets. 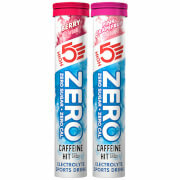 ZERO X'treme is an award-winning electrolyte sports drink tab with caffeine. It produces a clean tasting and highly refreshing drink with zero calories. The tabs contain light natural flavours with no artificial colours or preservatives. Used by athletes before and during exercise, caffeine helps improve attention, concentration and reaction time. ZERO X'treme is also widely used when driving and clubbing. Vitamin C in ZERO X'treme supports a healthy immune system, protects the cells from oxidative stress and contributes to the reduction of tiredness and fatigue. Magnesium in ZERO X'treme contributes to electrolyte balance, reduces tiredness and fatigue, whilst supporting muscle protein synthesis. Simply drop a tab into your re-usable sports bottle and watch it rapidly dissolve. The 20 tab tube makes up to 10 litres of drink, so it's great value for money. With minimal packaging, ZERO X'treme is environmentally friendly and easy to keep with you. The easy-break tabs mean that you can choose your ideal drink strength. Light & refreshing sports drink with caffeine. With Vitamin C and 5 electrolytes, including sodium, magnesium and potassium. This product contains 20 x tablets. The flavours are ok they do the job especially in the Aussie heat On 600ml water bottle use one tablet enough for me. Definitely would buy again. I used these Hydration Tabs during a 9 day Trek of the KOKODA Trail PNG in April 2017 and continue to use them on my Bike. Never had a problem with dehydration or cramping even though I live and ride in Darwin Australia. Highly recommend this product. This set is superb even though we did receive Berry favor instead of the Xtreme as described. Great tasting hydration i have ever tried. Simple just pop into a bottle of cold water and you will enjoy your sportive ride even better. The Cherry/Orange is my favorite pick and i find it taste much better than any isotonic drink. A must buy for endurance rider. Yum these up, good for summer days and salt crust turbo sessions. Mixed bundle negates boredom. Nice with a wee discount. These are great value. They are not too sweet or too salty, they dissolve easily and do not get lumpy in the jar like powder form sports drinks. I took two bottles on a 100km ride at the weekend and still felt good at the end of it. I bought 12 tubes of Zero, so they will last me for many rides. Tastes good and doesn't taint your water bottles. Also really good for a hangover! These tablets are easy to use they dissolve well and taste great , not too sweet. I have a need for hydration products as otherwise suffer during and post long rides, and can testify that these do their job well. For warm or hot weather cycling I always use this type of product. 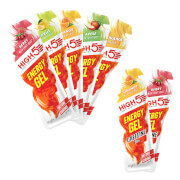 Some flavours are more appealing than others and some other brands are just as good but these are pleasantly flavoured and appear to provide the electrolytes needed. If I had any criticism I would have preferred more with caffeine. I always take a high5 bottle for the extra hydration qualities. These can be over priced and haven't been able to find them at this reduced price before.